*Editors Note* Masonic Oddities is a new series by Bro. Jason Richards that highlights Masonic memorials, monuments, museums, or other "craft curiosities" that lie off the beaten path of the casual Masonic traveler to remind brethren wheresoever dispersed that one can find light in the most unusual of places. About a year and a half back, my wife and I embarked on a whirlwind tour of Italy which ultimately led us to the beautiful city of Florence. 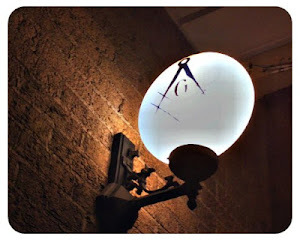 Whilst sitting up in our hotel room one night looking up attractions to visit the next day, I came across the website for the Museo di Symbologia Masonica, or Museum of Masonic Symbols. I excitedly explained my findings to my wife who, to her credit, obliged my curiosity and we set out the next evening to find what I can only describe as a mad scientist's treasure trove of Masonic artifacts. Nestled in an unassuming building on via dell'Orto, the museum is situated less than a quarter mile from the site of Italy's first Masonic lodge, founded in a tavern on via Maggio in 1731 by a group of English expatriates. The museum is run by Cristiano Franceschini, a fourth-generation Freemason, whose family's collection of Masonic artifacts set the groundwork for the museum, which opened in 2012. Bro. Franceschini welcomed us to his museum and graciously gave us a tour of his incredible collection. Masonic artifacts of all shapes, sizes, ages, and origins lined every inch of the museum's two floors. The exhibition houses more than 10,000 artifacts from the late 18th century to the present day, which include regalia, photos, posters, aprons, lapel pins (of course), a 4-binder Masonic stamp collection, and historical documents, among other oddities of all sorts. The museum's second floor houses a Chamber of Reflection and a small, Scottish-style replica lodge room which was, like the rest of the museum, packed to the gills with Masonic paraphernalia. After the initial tour, Bro. Franceschini pulled out his growing document library which contained everything from old charters to Masonic pamphlets to a Masonic stamp collection that filled four binders. After a couple of hours of browsing through the collection, my wife succeeded in convincing me to say my goodbyes to Bro. Franceschini, and we wandered up the street in search of an Italian trattoria for dinner. If you ever find yourself in the beautiful city of Florence with a bit of time to spare, Bro. Franceschini's collection is well worth the 7 euro price of admission. In a country with a Masonic culture that lives largely out of public view, the Museum of Masonic Symbols stands as a beacon to demystify the fraternity and encourage the public to explore its philosophy, symbols, and history. Bro. Jason Richards is the Senior Warden of Acacia Lodge No. 16 in Clifton, Virginia, and a member of both The Patriot Lodge No. 1957 and Fauquier Royal Arch Chapter No. 25 in Fairfax, Virginia. He is also Chaplain of Perfect Ashlar Council No. 349, Allied Masonic Degrees. He is the sole author of the Masonic weblog The 2-Foot Ruler: Masonry in Plain Language, and is a co-host on the weekly YouTube show and podcast The Masonic Roundtable. He lives in Virginia with his wife, cats, and ever-expanding collection of bow ties. I'm so jealous. I was there a few years ago and apparently it was the one week out of the year they were closed for holiday. Still, I enjoyed getting lost in Florence. I did however get to attend lodge in Spoleta, Italy the year prior. It was an awesome experience. They actually made arrangements to have an EA degree while I was there (completely in Italian). Yeah, you missed out! The museum was one of the highlights of my trip. Definitely a must-see for any brethren visiting Firenze.